a. Sorek means “vine” or “choice vine.” Samson is once again in a place that does not help him fulfill his Nazarite vow. b. This was in the area of Zorah, Samson’s hometown. c. Both Philistines and Jews lived in this area. 4) The frail one will use the power that she has to make the strong man weak. b. We do not know whether she was an Israelite or a Philistine. 2) Her close ties to the Philistine lords suggest that she was a Philistine. 3) Samson seemed to have a preference for Philistine women. 4) Some believe that she may have been a temple prostitute at the temple of Dagon. 5) She could have been a Jewish woman who was a sell out to the Philistines. 1. The persons who offered the reward: the lords of the Philistines, “…(they were the chief rulers of Philistia and were five in number [cp. 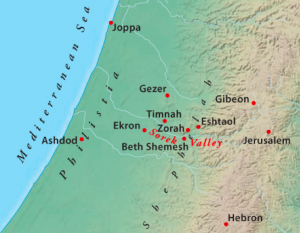 Joshua 13:3; Judges 3:3]; each represented and was ruler of one of the five main cities of the Philistines – Gaza, Ashkelon, Ashdon, Ekron, and Gath)” (Butler, 142). a. “They had precedent for this plan; for in Samson’s marriage to the Philistine girl in Timnath, it was proven by some male wedding guests that a beguiling woman could wheedle out of Samson pertinent information” (Butler, 143). 1) They wanted to see where his strength lay. NOTE: They knew his weakness, women. 2) They wanted to know by what means they could prevail against them. c. They ultimate purpose was not hidden from Delilah. 1) They wanted to bind him and afflict him. 2) She knew the evil they wanted to do to her “love,” and she still complied with their request. 3. The price of the reward: ...we will give thee every one us eleven hundred pieces of silver. a. Eleven hundred pieces of silver has been estimated to be about $140,800.00. b. Delilah was offered about three quarters of a million dollars to entice Samson. a. Enemy combatants have often used woman to entice the opposition (e.g., Balaam, Num. 25:1; Rev. 2:14). b. When immoral people occupy high positions in a nation, the security of the nation is at risk. d. We do not like Delilah, but Samson created his circumstances by his conduct. We often created our circumstances by our conduct. “People who complain that they never get any ‘breaks’ need to remember that if they want good circumstances, they need to behave properly” (Butler, 144). And Delilah said to Samson, Tell me, I pray thee, wherein thy great strength lieth, and wherein thou mightiest be bound to afflict thee. 2) To do this, she needed to know the source of his strength. 3) Delilah’s actions prove that she is a cruel, treacherous woman. 4) Samson may have immediately put two and two together. He may have known that this was a plot of the Philistines. 1) Green withes are bow strings that have not been dried for use on the bow and arrow (See Ps. 11:3, “string”). 2) Samson does not tell her the source of his strength. a) Some see Samson’s words as a lie, and others just see Samson playing her game. b) Samson should have immediately told her that he was not at liberty to tell her the source of his strength. c) Lesson: Samson should not have been playing with evil in any way (Prov. 6:27). The lords of the Philistines brought to her seven green withes which had not been dried, and she bound him with them. Now there were men lying in wait, abiding with her in the chamber. 1) Delilah was quick to follow through exactly as Samson had told her. 2) She could probably feel the money in her hands. She may have had some serious plans as to how the money would be used. 3) The Philistines were eager as well. They had men ready to apprehend this mighty warrior. And she said unto him, The Philistines be upon thee, Samson. And he broke the withes, as a thread of tow is broken when it toucheth the fire. So his strength was not known. a) It was a very simple feat. b) The cords were broken as easily as a twine of flax is broken when it touches a fire. 3) The concealment: So his strength was not known. a) Delilah was in the midst of deception and accused Samson of telling lies. b) Lesson: We often accuse others of evil in which we ourselves are involved. Sometimes we are so blind that we cannot see our personal transgression. …now tell me, I pray thee, wherein thou mightiest be bound. And he said unto her, If they bind me fast with new ropes that never were occupied, then shall I be weak as another man. Delilah therefore took new ropes, and bound him therewith, and said unto him, The Philistines be upon thee, Samson. And there were liers in wait abiding in the chamber. And he broke them from off his arms like thread.